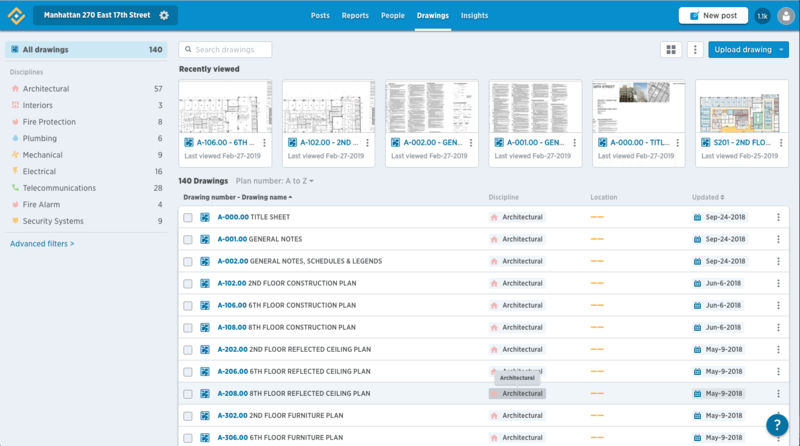 Once your project plans have been uploaded we recommend spending a little time getting things organized. It’ll help you as the Project Organizer to manage the library of drawings, and it will help the team in general find the right plan quickly. All management of drawings takes place on the Drawings page of the web app. Waste no time finding drawings you’re constantly using. See the top drawings you’ve recently viewed at the top of the web app on the drawings page. Fieldlens sets the plan number and name automatically - basing the number on the information in the title box on the drawing and the name from the title of the file. While this works for most PDF files, you should still double-check the names and numbers for accuracy. To edit them simply hover over the drawing thumbnail (expanded view) and click Edit or click the “...” to the right of the drawing name (list view). You’ll be able to click in and edit both name and number, as well as the discipline and locations as discussed below. Click Edit while hovering over the drawing and then the Discipline edit button to make any necessary changes. See the history of the project and view changes from versions at the moment you need it on both the web and mobile apps. There’s a column right were the north wall of conference room 505 was originally. I need to see how large it was originally to figure out how much space we’ll loose in the corridor. I need to see how many iterations of drawing A1001 we’ve had. You can add project locations to your drawings - then when you drop a pin on a plan, the location will automatically be added to the post as well. You’ll also be able to search through your plans by location - so you can see a list of all plans of the 2nd floor, for example. Click that same Edit button and then the Location edit button. You’ll see a list of any locations that have already been set up and be able to add a new one if necessary. Tags are used at the revision level rather than the drawing level. Users will typically add the bulletin number to each revision as it comes in and is approved. You can add or edit tags for any of your drawings. On the bottom left of the edit drawing panel, you’ll see a drop-down box, which will expand your list to show the version history of each drawing (even if there is only one drawing). On the bottom right, you’ll see the option to Add or Edit a Tag. On the sidebar of the drawings page you can access the drawings filters to refine your list to plans with posts associated with them, specific locations, categories or tags. When you hover over your drawings you’ll see a check box to the left (upper left on thumbnail view). You can select multiple drawings and bulk-edit disciplines, locations and tags. You can also select drawings this way to unpublish or delete them altogether. Once one or more drawings are selected you’ll see Delete and Unpublish buttons at the top right. Drawings that have been unpublished will no longer be accessible on mobile devices and will only be visible on the web for Project Organizers. Use the filters to the left of the drawings page to access and/or republish them.